Dimethyl sulfoxide (DMSO) is frequently used at a concentration of up to 95% in the formulation of antiherpetic agents because of its properties as a skin penetration enhancer. Here, we have analyzed the effect of DMSO on several parameters of Herpes Simplex Virus replication. Productive infection levels of HSV-1 were determined by plaque assay or by reporter gene activity, and its DNA replication was estimated by PCR. Transcript levels were evaluated with HSV-specific DNA micro-arrays. DMSO blocks productive infection in vitro in different cell types with a 50% inhibitory concentration (IC50) from 0.7 to 2% depending upon the multiplicity of infection. The concentration dependence exhibits a Hill coefficient greater than 1, indicating that DMSO blocks productive infection by acting at multiple different points (mechanisms of action) with positive cooperativity. Consistently, we identified at least three distinct temporal target mechanisms for inhibition of virus growth by DMSO. At late stages of infection, DMSO reduces virion infectivity, and markedly inhibits viral DNA replication. A third mode of action was revealed using an oligonucleotide-based DNA microarray system for HSV. These experiments showed that DMSO reduced the transcript levels of many HSV-1 genes; including several genes coding for proteins involved in forming and assembling the virion. Also, DMSO markedly inhibited some but not all early transcripts indicating a previously unknown mode for inhibiting the early phase of HSV transcription-replication cycle. These observations suggest that DMSO itself may have a role in the anti-herpetic activity of formulations utilizing it as a dispersant. Herpes simplex virus-1 (HSV-1) is an enveloped double-stranded DNA virus of humans, which has a broad host range for animals and cell type. Although most of herpes infections are mild, they can cause lethal encephalitis, particularly in infants. Indeed, herpes infections are a major cause of encephalitis, accounting for 20% of the cases . An important characteristic of herpes virus is their ability to establish latent infections in the neurons of sensory ganglia innervating the site of initial infections (reviewed in ). The virus can reactivate spontaneously or under conditions of stress, causing recurrent infections in the site of initial infections. For instance, reactivation of latent infections in the trigeminal ganglia causes recurrent infection in the cornea leading to scarification [3–5]. This is a major cause of blindness induced by infection in developing countries and a major reason for corneal transplantation treatments in developed countries. While through latency, herpes can evade both the immune surveillance and antiviral drug-therapy, inhibition of acute replication during primary or reactivating infection through the intervention of anti-herpes drugs is of significant importance. To develop more efficient antiviral therapies it is essential to have an understanding as comprehensive as possible of the mode of action of the different antiviral agents as well as the possible action of the vehicles used in their formulation. Recently developed micro-array technology greatly facilitates the global analysis of a drug on the expression of most of the viral genes and on a number of cellular genes . Currently, the most widely used anti-herpetic agents are nucleotide derivatives such as Acyclovir, adenine arabinoside, Edoxidine, Idoxouridine and pencyclovir . These compounds block viral replication by inhibiting viral DNA polymerase and thymidine kinase activities. Other drugs with anti-herpetic potential include alpha and beta interferons, ribonucleotide reductase inhibitors (tiocabonohydrazone), inhibitors of virus penetration (Tromantadine) and other inhibitors of viral DNA polymerase (Foscarnet). Intravenous, oral and topical routes are common to administer different antiviral agents. In the case of skin infections, topical applications have several advantages, including convenience and reduction of side effects. In addition, it is possible to obtain higher concentrations of the antiviral drug at the locus of viral replication when the drug is formulated with a skin penetration enhancer . DMSO is one of the most frequently used skin penetration agents for antiherpetic drugs and is generally used at a concentration of up to 95% . It has been used in the formulation of Idoxouridne , adenine arabinoside, Acyclovir and Cidofovir [9, 11]. It has been shown that the efficacy of the antiviral agent correlates better with its in vitro index when applied topically in the presence of DMSO or other penetrating agents . 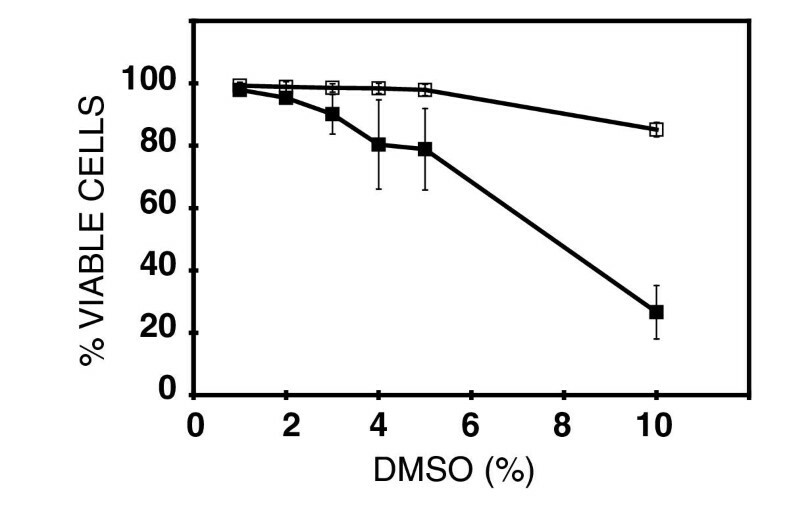 Despite its usefulness, effects of DMSO itself on HSV-1 are not well characterized. It has been reported that DMSO induces viral reactivation both in the mouse ear model and in explanted ganglia [12–16] and facilitates productive infections of Vp16 negative strains . For these reasons, we considered it was of interest to describe the effect of DMSO on parameters of HSV-1 replication during productive infection and carried out a global analysis of the effect of DMSO on HSV gene expression, utilizing our recently developed micro-array system. Here we report that DMSO was able to block productive infection in Vero cells when administered after virus adsorption. DMSO seems to cause this effect by acting at different sites with positive cooperativity, as suggested by the Hill numbers of the inhibition curves. Accordingly, we show that DMSO inhibits HSV-1 viral DNA replication, reduces the stability of the free virion, and also reduced the levels of a number of viral transcripts. Interestingly, this reduction included only a subset of early transcripts, which is a novel mode for inhibiting the early phase of productive infection. These results indicate that DMSO has the capacity to potentiate the action of antiviral agents in vivo, not only by enhancing their penetration, but also by affecting some viral functions. Rabbit skin fibroblasts were used to grow the virus and Vero cells to analyze the action of DMSO and for plaque assay. The analysis of gene transcription was carried out in human foreskin fibroblasts (HFF). Rabbit skin fibroblast and Vero cells were cultured in Eagle's minimum essential medium (EMEM) containing 5% bovine serum and supplemented with 100 U/ml penicillin and 100 μg/ml streptomycin; HFF were cultured in EMEM containing 10% fetal calf serum and 100 μ M G418. The cultures were maintained at 37°C under 5% CO2. In the experiments indicated, we used the recombinant virus HSV-1 (dUTPase/LAT) [18, 19] containing the bacterial β-galactosidase gene under the control of the dUTPase promoter placed in the locus of the LAT gene virus. The specific infectivity (plaque forming units per relative particle number) of these constructs is similar to the wild type virus . Vero cells cultures 90–100% confluent, in 24-well plates (~105 cells/well) were infected with 1000 PFU of this recombinant virus (multiplicity of infection of 0.01 PFU/cell). For these infections, the medium was removed and the wells rinsed with saline. The cells were incubated with 0.5 ml of virus suspension in PBS-glucose, for 1 h at 37°C with slow rocking. After this adsorption period, the virus suspension was removed and replaced with overlay medium (Eagle's minimum essential medium containing 5% fetal calf serum, supplemented with 0.34 mM arginine 100 U/ml penicillin and 100 μg/ml streptomycin). Incubations were continued at 37°C until harvest. We have shown that the reporter β-galactosidase expression at 24 h p.i. is proportional to the number of PFU in infections with a multiplicity of ≤0.1 , and, for convenience, we have used this rapid and accurate procedure instead of a plaque assay to assess productive infection where indicated in the results section. For this assay, the medium was removed and the cells resuspended in 1.5 ml of 10% sucrose in PBS, using a policeman. The suspension was centrifuged at 2000 g for 10 min, the supernatant removed and the cell pellet resuspended in 100 μl of fresh 10% sucrose in PBS. The cells were then permeabilized by 3 cycles of freeze thawing. Aliquots of 20–40 μl of these suspensions were mixed with 0.4 ml of incubation buffer (1.2 mM MgCl2, 60 mM KHP04, pH 7.8), and chlorophenol red-β-galactopyranoside (Boeringer Mannheim) was added to 5 mM final concentration. The reaction was allowed to proceed for 10–30 min at room temperature and stopped by adding 200 μl of 20% lactose. Product formation was evaluated by measuring absorbency at 550 nm. The cytotoxic effect of DMSO (Sigma or Fisher) treatment on Vero cells was evaluated by the method of sulforhodamin B (SRB) [22, 23]. Cells in 96-well plates were treated with different concentrations of DMSO for either 8 or 24 h. After the treatment, the wells were washed three times with saline and fresh medium was added. Forty eight hr after the initiation of the treatment with DMSO cells were fixed with 10% trichloroacetic acid (TCA) for 30 min at room temperature (RT). TCA was washed and the wells were dried overnight at RT. The cells were stained with 4% SRB in 1% acetic acid for 30 min at RT, washed with 1% acetic acid and dried overnight. SRB was extracted with 0.2 ml of 1 mM Tris Base and the densitometry read at 520 nm in an ELISA reader. Values were expressed as percent of controls from untreated wells in the same plate. DNA was extracted as described previously  with some modifications. To each well of infected cells in 24-well plates with 0.6 ml of extraction buffer (25 mM EDTA, 100 mM NaCl, 1% SDS, 10 mM Tris pH 7.5) and 50 μl of proteinase K solution (15 mg/ml) were added and then they were incubated overnight at 48°C. The DNA solution was extracted three times with phenol-chloroform (1:1) and once more with chloroform. The DNA was precipitated with ethanol overnight and pelleted by centrifugation. The pellet was washed once with 70% ethanol, air-dried and dissolved in 200 μl of water. For this analysis we have used a semi-quantitative radioactive PCR procedure previously described [21, 24]. This procedure is able to detect 1 pg of purified HSV-1 DNA when using a plasmid preparation containing a fragment of the VP5 gene. When purified viral DNA is mixed with uninfected ganglia it is possible to detect less than 1000 viral genomes. Thus, the approach is able to detect the viral DNA and RNA-after conversion to cDNA-generated by a single infected cell. To normalize signals for the recovery of DNA, an actin primer set is used to amplify cellular signals. The ratio of both signals is determined by densitometry. Amplification by PCR was carried out as previously described [24, 25], using the following primer sets (sense/antisense strand): VP5 (149-bp product), 5'-TGAACCCCAGCCCCAGAAACC-3'/5'-CGAGTAAACCATGTTAAGGACC-3'; rabbit actin (110-bp product) 5'-AAGATCTGGCACCACACCTT-3'/5'-CGAACATGATCTGGGTCATC-3'. The reactions were carried out in M.J. Research thermal cycler as follows: denaturation, 94°C for 30 sec; annealing, 55°C for 30 sec; and extension, 60 s at 72°C. The final cycle was terminated with a 10-min extension step. The products were made radioactive for autoradiography and image quantitation by addition of 0.2μC of [α-32P]dCTP. For each reaction we used 20 μl (10%) of the DNA sample, and the final volume of the reaction was 100 μl. One fifth of the amplified product (corresponding to 2% of the original material) was fractionated on 6% polyacrylamide gels in Tris-borate-EDTA. The PCR signals were visualized by scanning an appropriately exposed autoradiogram by use of a Deskcan II scanner (Hewlett-Packard). The signals were quantified by densitometry using IP Lab Gel software (Signal Analysis Corporation) in accordance with operational instructions. For the preparation of total RNA from infected cells and mock-infected cells we followed procedures previously described . For each preparation of RNA, 2 confluent 8 cm dishes of human fibroblasts were used. Virus adsorption was carried out for 30 min in 10 ml of PBS-10% glucose and then replaced for fibroblast medium in the presence or absence of 4% DMSO, and infection was continued for 6 h. Total RNA was extracted using the Trizol procedure (GIBCO-BRL). Poly A RNA was prepared from total RNA using a magnetic beads procedure (PolyATract mRNA isolation system IV, Promega). Typically, yields were 1% of total RNA. Fluorescent-labeled cDNA was prepared from 1 μg of poly(A) RNA from infected and mock-infected cells using SuperScrip II reverse transcriptase (Gibco-BRL) and random hexamer primers. The nucleotide concentrations in the reaction were: 0.5 mM dGTP, dATP and dTTP, 0.3 mM dCTP and 0.1 mM fluorescent nucleotide (Cy3-, Amersham). Fluorescent-labeled cDNA was purified by filtration and washes through Microcon YM-30 filters (Amicon); then heat denatured for 2 min at 99°C, incubated for 20-30 min at 37°C and centrifuged 2 min at 140,000 × g (to remove any solid impurity). Hybridization to the micro-array  was for at least 16 h at 68°C in 15 μl of 5×SSC-0.2% SDS under a coverslip. After hybridization, the micro-array slide assembly was washed sequentially in 1×SSC-0.2% SDS, 0.1×SSC-0.2% SDS and 0.1×SSC for 5 min at room temperature and spun dry in a low-speed centrifuge. Micro-arrays were scanned by using a confocal laser scan system (Scan Array 4000, General Scanning). Data were collected at 10 um/pixel 16 bits of depth, using Quantarray software (General Scanning). In the course of studies on the effect of surfactants on HSV replication, we noted that percentages of DMSO greater than 0.2% resulted in significant decreases in yields of infectious HSV in infected cultured cells. Accordingly, we did a dose-response experiment to determine the details of this effect (Figure 1). We determined the 50% inhibitory concentration (IC50) to be 0.65% in Vero cells infected at a multiplicity of infection of 10 PFU/cell when the cells were incubated with various concentrations of DMSO in the overlay medium for 24 following infection. Effect of DMSO in the productive infection of HSV-1. Cultured Vero cells (105 cells in 24-well plates) were infected with 1 million PFU of the dUTPase/LAT recombinant virus. After 1 hr adsorption period, overlay medium was added containing the indicated concentrations of DMSO. At 24 hr post-infection, the cells were harvested and the virus yield was determined by plaque assay. Data are the average ± SD of 3 duplicate determinations. Since high concentrations of DMSO are known to be cytotoxic, it was possible that all or part of the effect of DMSO on productive infections was a consequence of this toxicity. For this reason, we analyzed the cell toxicity of DMSO treatment for 24 hr, or for 8 (Figure 2) by the method of sulforhodamine B [22, 23]. Incubation with 5% DMSO for 24 hrs resulted in a mortality of about 20%, but there was no significant effect observed at this concentration when the treatment was carried out for only 8 hr. Cell toxicity of DMSO. Confluent cultures of Vero cells in 96-well plates were treated with the indicated concentrations of DMSO for either 24 h (filled circles) or for 8 hr (open circles) and cytotoxicity determined 28 hrs after the initiation of the treatment. Results are average ± SD of 4 duplicated determinations. In order to more fully characterize the effect of DMSO treatment on virus replication, we utilized the approach described in our studies on the effect of suramin on virus spread . As shown in that study, the measurement of reporter β-galactosidase gene activity in a recombinant reporter virus where the indicator gene is controlled by the HSV UL50 (dUTPase) promoter inserted into the LAT locus provides an excellent measure of virus replication as long as the initial multiplicity of infection is low (≤ 0.1). 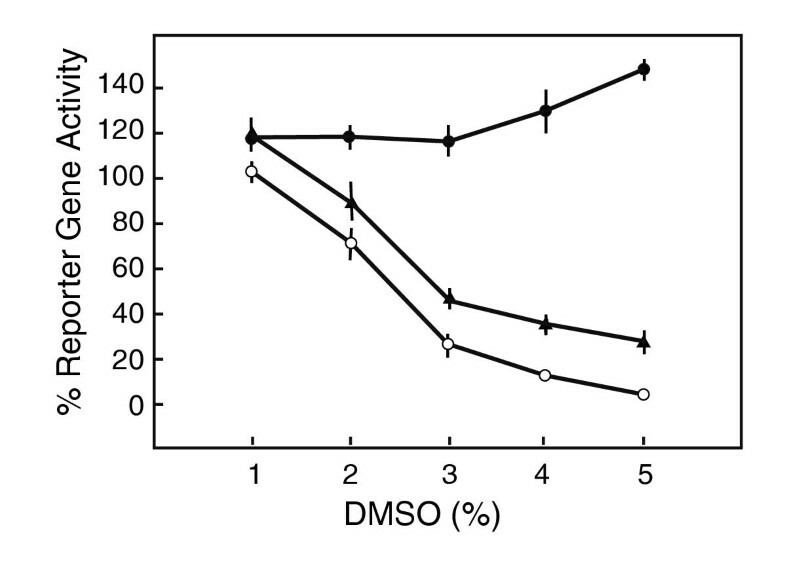 We found that DMSO was more efficient in blocking productive infection when present after the adsorption phase as follows (Figure 3). Cells were pretreated for 24 h before adsorption with various concentrations of DMSO, infected at a multiplicity of 0.01 PFU cells with reporter virus, and then reporter gene activity assayed at 24 hr following overlay with normal medium. Parallel experiments were carried out by having the same concentrations of DMSO present during the 1 hr adsorption period or during 23 hr following adsorption. 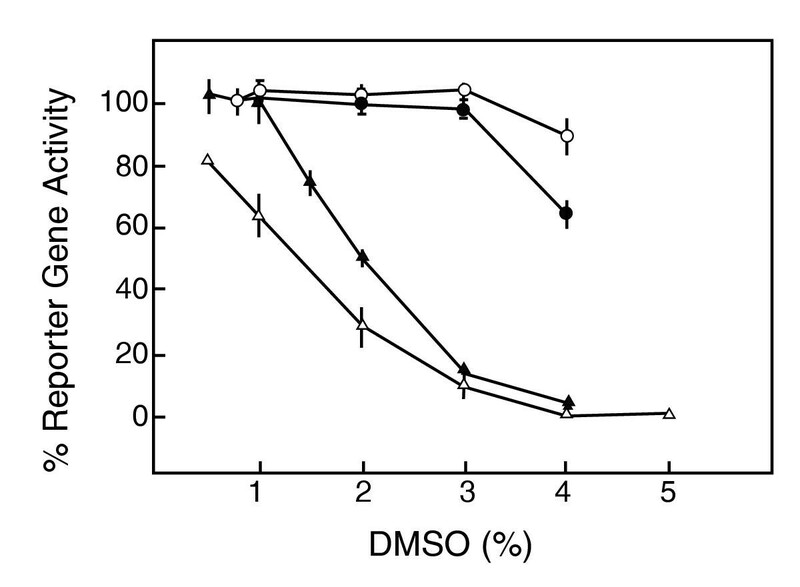 Pretreatment of cells with DMSO produced a reduction of 30% of productive infection at 4% DMSO; such a reduction results most likely from the cell toxicity of DMSO demonstrated above. No significant reduction of productive infection was observed when DMSO was present only during the adsorption phase (ca 10% at 4% DMSO). However, when present after adsorption DMSO blocked productive infection as assayed by reporter gene expression with an IC50 = 2.06 ± 0.36 and a Hill coefficient (NH) of 4.2 ± 0.2. A value of the NH>>1 suggests that DMSO acts at multiple sites with positive cooperativity to inhibit productive infection . Effect of DMSO treatment on productive infection at different phases of infection. Cultured Vero cells (105 cells in 24-well plates) were infected with 1000 pfu of the dUTPase/LAT recombinant virus. Treatments were as follows: DMSO at the indicated concentrations was present for 24 h before adsorption (filled circles), during the adsorption phase (open circles) or for 23 hr after the adsorption period (filled triangles). Also included is the effect of DMSO present for 23 hr after adsorption on HFF cells infected under similar conditions (open triangles). Reporter gene activity was determined at 24 hr following infection. Data are the average ± SD of 3-6 duplicate determinations. We next determined the length of the treatment with DMSO required to block productive infection (Figure 4). 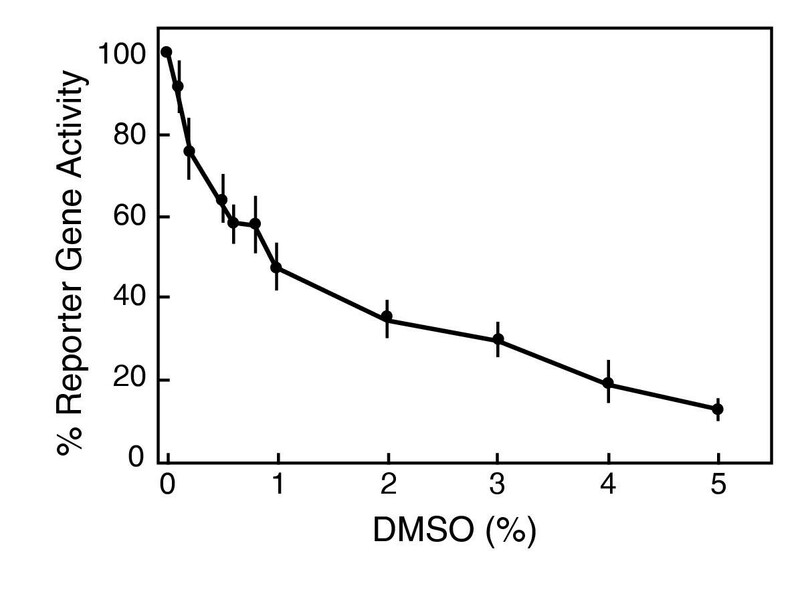 In this experiment, DMSO was added to 4% concentration in overlay medium immediately after the adsorption phase and replaced for overlay medium (without DMSO) at the indicated times. At 24 hr, the level of productive infection was determined by reporter gene activity assay. An inhibition of 50% was achieved after 4-5 h treatment, and an almost complete blockade of productive infection was achieved when DMSO is present for the first 8 h after adsorption. Time course dependency of DMSO blockade of productive infection. Cultured Vero cells (105 cells in 24-well plates) were infected with 1000 PFU of the dUTPase/LAT recombinant virus. 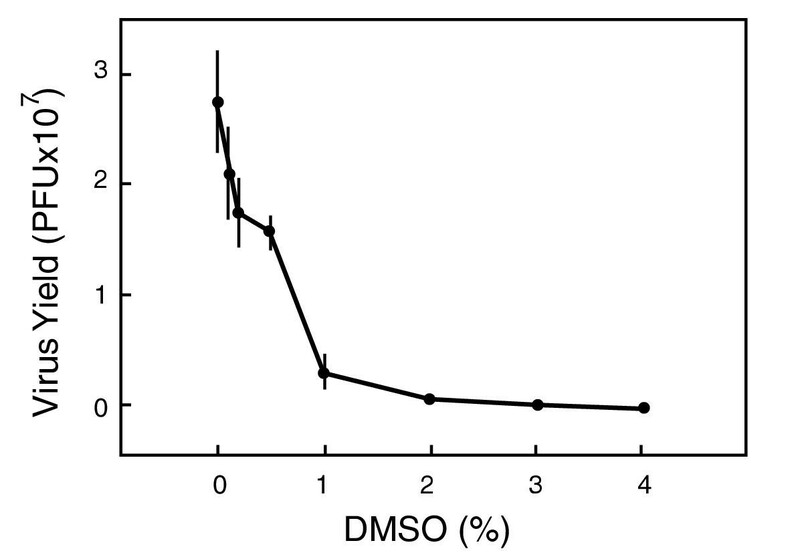 After the adsorption phase, 4% DMSO was added in the ovelay medium and kept for the indicated time periods. At those times, the media were replaced with fresh overlay medium without DMSO and the incubation continued 24 hr. Reporter gene activity was determined at 24 hr post-infection. Data are the average ± SD of 3-6 duplicate determinations. Since the treatment with 4% DMSO for 8 hr caused practically the same extent of blockade as the treatment for 23 h (compare Figures 1, 3, and 4) and this treatment has no effect on cell toxicity, we more carefully analyzed the effect of DMSO treatment for 8 h (Figure 5). Cells were treated for 8 hr with DMSO either before, immediately after adsorption or 15 h later (from 16 to 24 hr following infection). The 8 hr pretreatment with DMSO demonstrated no effect on productive infection as assayed by reporter gene expression. Rather, there was a small stimulation of productive infection, which was clear at concentrations above 4% of DMSO; however, we do not consider that the extent of this stimulation is biologically relevant. When the treatment was carried out immediately after adsorption, the values for IC50 (2.34 ± 0.36%) and NH (4.1 ± 0.5) were not significantly different from those obtained when the treatment was carried out for 23 h (p = 0.163, Figure 3). However, when DMSO treatment was started at 15 h after adsorption, the value of the IC50 (2.89 ± 0.15%) was somewhat higher. Although small, this difference is statistically significant (p = 0.028) with respect to the 23 h treatment. The value of NH was somewhat smaller (3.2 ± 0.7), but this difference was not significant. Effect of 8 hr treatment of DMSO at different phases of infection. Cultured Vero cells (105 cells in 24-well plates) were infected with 1000 PFU of the dUTPase/LAT recombinant virus. Treatments were as follows: DMSO at the indicated concentrations were present for 8 h before adsorption (filled circles), 8 h immediately after adsorption (open circles) and 16 to 24 hr (triangles). Reporter gene activity was determined at 24 pi. Data are the averages ± S.D. of 3-6 duplicate determinations. To get some insight on the mechanism of DMSO inhibition of HSV-1 productive infection, we studied the action of DMSO on the infectivity free HSV-1 virions, viral genome replication, and global patterns of transcription. In order to assess the action of DMSO on free virion infectivity, we incubated semi-purified preparations of cell-free reporter virus at 37°C in the presence of different concentrations of DMSO for 7 hr followed by infection of Vero cells at a multiplicity of 0.01 PFU/cell via adsorption for 1 h in the presence of DMSO. Infected cells were then incubated for 24 hrs and reporter gene activity assayed. As shown in Figure 6, the IC50 was found to be 0.95 ± 0.10% with an NH not different from 1. Such a result suggests that virion inactivation is only one component of the overall inhibition of virus replication detailed in the previous section. Inactivation of HSV-1 virion infectivity by DMSO. The dUTPase/LAT recombinant virus was suspended in PBS-glucose medium at 2000 PFU/ml and incubated at 37°C for 7 hr. Aliquots of 0.5 ml of the suspension were then adsorbed to Vero cells (105 cells in 24-well plates) for 1 hr. The virus suspension was then replaced with overlay medium, and reporter gene activity was determined at 24 hr. Data are the averages ± S.D of 4 duplicate determinations. PCR analysis of HSV-1 DNA replication in the presence or absence of DMSO. Total DNA was isolated from cultures of Vero cells infected with 1000 PFU of the dUTPase/LAT recombinant and the indicated hrs post-infection and amplified in the conditions described in Material and Methods. Aliquots of the amplified products were fractionated in 6% polyacrylamide gels in Tris-borate-EDTA and evaluated by densitometry. Our recent development of an oligonucleotide-based DNA microarray for assaying HSV transcription patterns [6, 27] afforded us the means to carry out a global analysis of the effect of 4% DMSO on the levels of viral mRNAs. Since we found that the treatment has an effect on viral DNA replication, we compared it to the effect of the presence of 300 μg/ml PAA treatment – a treatment known to cause >99% inhibition of viral DNA replication . Our analysis of viral transcription was studied in human foreskin fibroblasts; because our micro-array contains only human cellular probes, we used these cells instead of Vero cells in order to be able to gauge the effect of DMSO treatment on selected cellular transcripts. As shown in Figure 3, we determined that the inhibition of productive infection at a multiplicity of 0.01 PFU/cell by DMSO in these cells was similar to that observed in Vero cells (IC50= 1.4 ± 0.5, NH = 3.1 ± 0.65). Treatment of HFF cells with 4% DMSO for 8 h caused no significant cell mortality (99 ± 6% survival, n = 8) when the treatment was for 8 h, but it had some cytotoxic effect when the treatment was for 24 h (60 ± 4% survival, n = 8). Thus, transcription analysis was carried out for a 6 h DMSO treatment. For analyzing the transcription, infection was carried out at a multiplicity of infection of 1 PFU/cell, DMSO or PAA added following virus adsorption, and RNA isolated 6 hr after the 1 hr adsorption period. Poly(A) containing RNA was purified, and cDNA synthesized using Cy3-flouresencent dye tagged dCTP. We carried out three replicate hybridizations of each treatment regimen and normalized the total HSV-1 specific fluorescence signal to the 75th percentile value for each experiment. Results are shown in Table 1 (Additional File); those transcripts uniquely resolvable with this chip are indicated. The level of most HSV-1 transcripts was significantly reduced when 4% DMSO is present during the infection. Levels of reduction varies between none to 12-fold, and while this inhibition was not selective for any specific kinetic class, great reductions were found in some genes coding for structural proteins and virion assembly (major capsid protein–UL18/20; capsomer tips–UL35, virion maturation – UL21, and the gB/maturational protease family – UL27/28). The four immediate early genes that can be uniquely resolved (ICP0, ICP4, ICP27–UL54, and ICP22–US1) were not significantly affected. This pattern of inhibition was similar but clearly different to that seen when PAA was used to inhibit viral DNA replication. Expectedly, a number of kinetically late transcripts were more markedly reduced in the presence of the DNA synthesis inhibitor. Here, and in a previous paper ) we observed that PAA reduces the level of some early genes. This seems to contradict the observation that only some late, but not early protein synthesis is blocked by PAA . This can be attributed to different experimental conditions, such as a MOI = 50 in that report. In fact, at MOI = 2 a reduction in the level of ICP0 transcript was reported . Three early transcripts, the ribonucleotide reductase family (UL39/40), dUTPase (UL50), and the UL56 pathogenesis gene were greatly inhibited by DMSO treatment while being relatively unaffected by the inhibition of viral DNA replication by PAA. This was not seen with the thymidine kinase transcript (UL23). Finally, three immediate early transcripts, which show a marked reduction in the presence of 300 μg/ml PAA for 6 hr as compared to the control were not affected to anywhere near as great a degree with DMSO treatment (ICP27–UL54, ICP0, ICP22–Us1). The blockade of early transcripts clearly demonstrates that the reduction of transcripts levels by DMSO treatment and not solely due to its significant inhibition of viral DNA (Figure 7). We analyzed a set of cellular transcripts known to be involved in the stress response under these various conditions of infection. We found that upon comparison of mock infected samples; DMSO did not alter significantly the level of any cellular transcript included on the current chip whose signal was equal to or above the SSC background (ca 500 units) (data not shown). When we compared the level of expression of cellular genes at 6 hr following the control infection vs the DMSO treatment, we found that the expression of four cellular genes (Activating transcription factor 3(ATF3), Human cyclin B, FOS like antigen 1 (FRA-1), and JunBta) showed a signficantly different level of expression in DMSO treated cells as compared to infected control cells. Thus, ATF3 median level was 172 (S.D. 1095) units in untreated vs 9747 (S.D. 3863) in DMSO (p = 0.04); CyclinB control median 361 (S.D. 228) vs 1427 (S.D. 495) in DMSO (p = 0.03); FRA-1 control median 1749 (S.D. 1277) vs 12,380 (S.D. 3778) in DMSO (p-0.03); and, JunBta control median 3504 (S.D. 5468) vs 33,986 (S.D. 1535) in DMSO (p = 0.01). These data suggest that the effects of an early block on HSV gene expression might be related to changes in cellular factors. However, the biological significance of the differences detected in the study is unclear at this time. Our results show that DMSO blocks productive infection of HSV-1 in cultured cells. The dose-response curves of the blockade have a Hill coefficient (NH) greater than three, indicating that DMSO exerts its effect by acting at different points of the productive infection cycle with high positive cooperativity . In agreement with such an interpretation, we observed that DMSO inactivated free virions, blocked expression of specific HSV-1 transcripts, inhibited viral DNA replication, and affected the virus-induced shut-off of expression of four cellular genes. All these actions are observed at conditions in which DMSO does not have any significant cytotoxic action. The observation that 50% inhibitory concentration of DMSO is significantly below the cytotoxic concentration suggest that DMSO may have a specific inhibitory activity. Evidence in strong support for a specific action of DMSO was uncovered in experiments based on global transcriptional analysis using our recently described oligonucleotide-based DNA microarray provided us with a powerful tool to dissect some of the effects of DMSO on viral gene expression. As shown in Table I, DMSO reduces the level of transcription of many HSV-1 genes, and the reductions is not solely a result of a general inhibition of viral DNA synthesis since there are some marked differences in the pattern of transcript abundance seen in the presence of 300 μg/ml PAA as compared to 4% DMSO. Interestingly, the levels of the immediate early genes involved in the regulation of other viral genes (ICP0, ICP4 and ICP27) were not appreciably affected, while, and in contrast, the largest reductions in transcript levels (over 7-fold) were generally found in genes coding for structural proteins. This points to the possibility that DMSO blocks the maturation of virions. DMSO showed a previously unappreciated manner of inhibiting early phase of HSV-1 productive infection, as it inhibited some but not all early transcripts. Some of these early transcripts such as ribonucleotide-reductase (UL39) and dUTPase (UL50) are strongly inhibited. This inhibition may have a role in the reduced viral DNA replication seen upon DMSO treatment. Most of the eighty-odd cellular transcripts on the DNA microarray  used in these experiments do not provide sufficiently strong signals with infected cell RNA to allow statistically reliable analysis . Still, it is interesting that four cellular transcripts (Activating transcription factor 3, Human cyclin B, FOS like antigen 1 and JunBta) were significantly increased in DMSO-treated infected cells. While potentially interesting, these results are not of sufficient breadth to indicate whether alterations of cellular functions are a factor in the overall inhibition of viral replication. Our results show that DMSO can block HSV-1 productive infection in vitro. As shown by a Hill coefficient greater than 1, the mechanism of this blockade is complex, with DMSO altering several temporally distinct viral functions. In vivo, DMSO has been shown to enhance the effect of several antivirals. This effect has been attributed to the ability of DMSO to penetrate the skin . The results of this study suggests the possibility that DMSO may also further enhance antiviral activity through a previously undisclosed inhibitory action. This work was supported by grants CA11861 and 90287 (EKW) from the National Cancer Institute and BBSRC (PG). JSA was the recipient of a UCI Faculty Career Development Award. We thank M.K. Rice for valuable assistance, Alan Ross for assistance in microarray fabrication and S.W. Stingley, P. Lieu and G.B. Devi-Rao for helpful discussion. Author 1 (JSA): Conceived of the study, carried out the experiments on productive infection levels, cytotoxicity, PCR and micro-array analysis, and drafted the manuscript. Author 2 (DR): Fabricated micro-array and participated in its design. Author 3(PG): Participated in analysis of microarray data, experiment design, and manuscript writing.